At the start of this year: 2015. We’re planning to rebuild the Newsletters to increase connections among your ideas and with audience interests, one of things to do in our checklist is Reponsive Email Templates for Newsletters issues. 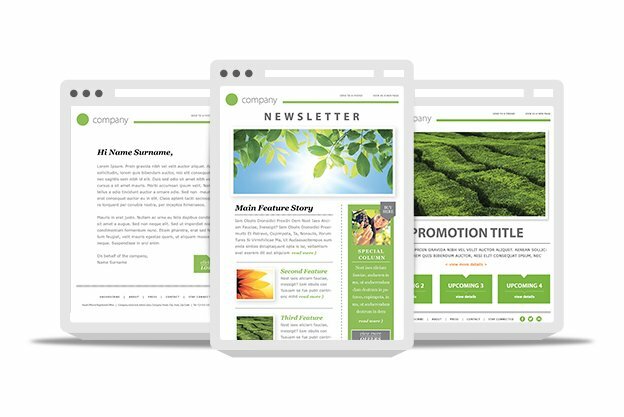 Here in this article you will find 10 Awesome Responsive HTML Email Templates for Newsletters hand picked for you. 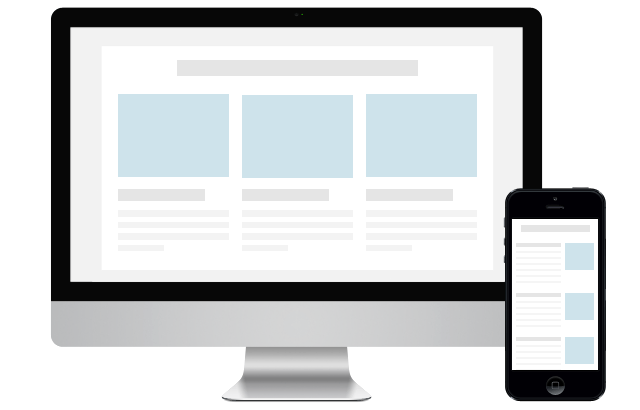 Why we need Responsive Email Templates? 80% of Internet Users own a smartphone/tablets, illustrating the need for businesses to design email campaigns for the growing mobile market. If you want people to engage with your emails from their smartphones, it’s important to keep your messages short, focused, and visual. 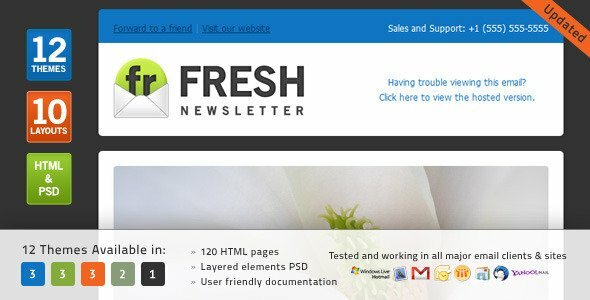 12 Themes each of them contains 10 Ready to use HTML newsletter pages. 1 layered Photoshop File contains all themes graphic elements in case you want to change or create new color. Very easy to customize it through user friendly documentation. Ability to copy/paste rows from layout to another. Ability to delete/duplicate any row. Compatible with all major email clients and sites, Tested in Microsoft Outlook (2000, 2002, 2003, 2007, 2010 Beta), Apple Mail (3, 4), Lotus Notes8, Thunderbird (2, 3), Windows Mail, Windows Live Mail, Yahoo Mail, Hotmail, Gmail, Postbox, Entourage 2008 and AOL Mail. Compatible with all browsers, HTML pages rendered perfectly In Internet Explorer ( 5.5, 6, 7, 8 ), Firefox, Google Chrome, Opera and Safari. Zurb do a lot of great things for the web community. Zurb Foundation is what I consider to be default frontend framework for our themes and designs. Ink is an open source framework that will help you quickly build responsive HTML emails for all major email clients. Even in outdated and notoriously problematic ones like Outlook 2000. BlauMail is a modern email template with a nice modern look. With its compact structure and strong visual impact, BlauMail will help you deliver rich content to your users/clients. Send product updates, news, special offers and social events details. Highlight important content by using the call to action buttons or other visual elements. 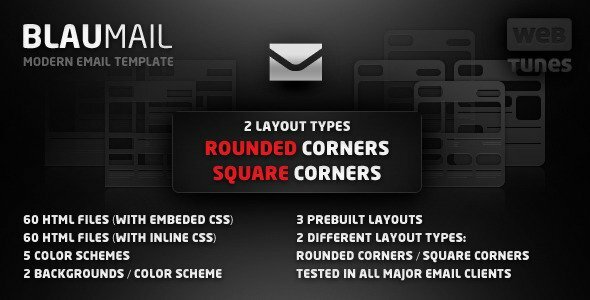 BlauMail comes in 5 flavors (Blue, Red, Green, Orange and Violet), 3 prebuilt layouts, 2 background variants and 2 types of corners: ROUNDED and SQUARE. 60 HTML files (with embedded CSS). 60 HTML files (with inline CSS). 60 PSD files which each layer properly named for easy customization. Antwort offers responsive layouts for Email that both fits and adapts to client widths. Don’t underwhelm desktop users with single column layouts that work for mobile. Antwort offers columns on desktop that automatically become rows on mobile. 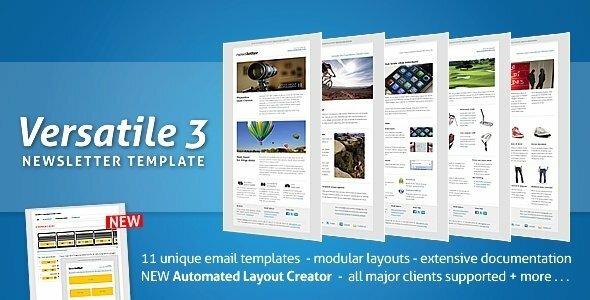 The combination between the 11 unique newsletter templates, an easy to use automated layout creator that allows the creation of new newsletter templates instantly, modular layouts that simplify extending/ adapting newsletter templates and robust, properly tested and commented source code makes Versatile Newsletter 3 one of the most complete newsletter packages you can buy at themeforest. 2 versions for each layout: one with embeded css and one with inlined css. in minutes, WITHOUT writing source code for the most part by using the Automated Layout Creator. Each is available in green, blue, orange and grey. We recommend that you import the email template files into an email marketing tool like Mailchimp. This way, you can easily use their email editor to add your own company logo (simply the replace the sample logo that we’ve included), update the placeholder copy in the email and add your own website links. You can review what your email looks like using your email marketing tool and schedule it to be sent out to your subscriber base. 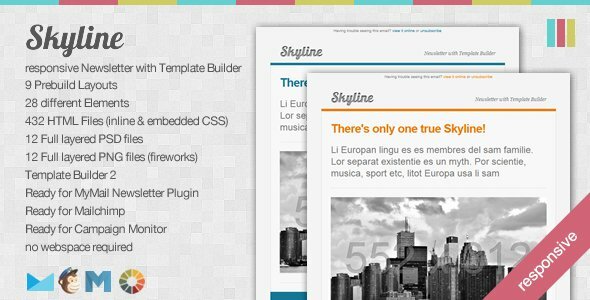 a module based responsive template with Template Builder. The Template Builder let you create your template in three simple steps. With this Theme you get a Template Builder for easy Template making. Perhaps you’re more of a DIY kind of marketer. Then you’ll like Campaign Monitor’s email templates. 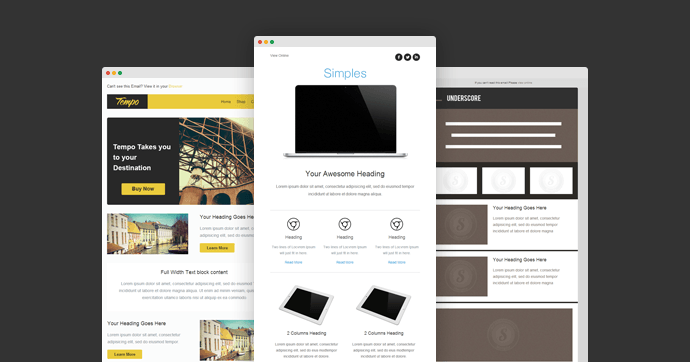 The popular email service provider allows you to build your own template. You can choose your own layout, font, color scheme and much more. After building your template, you have the option to save it to your Campaign Monitor account (if you have one) or download it for free. 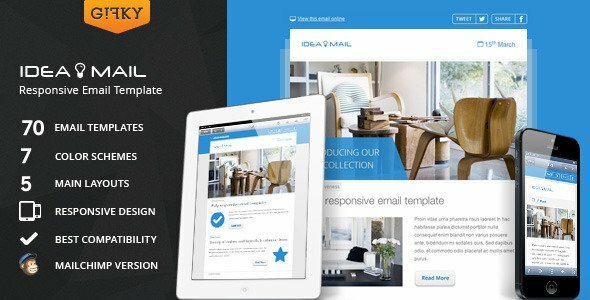 70 Responsive HTML email templates (7 color themes, 2 background versions, 5 layouts). 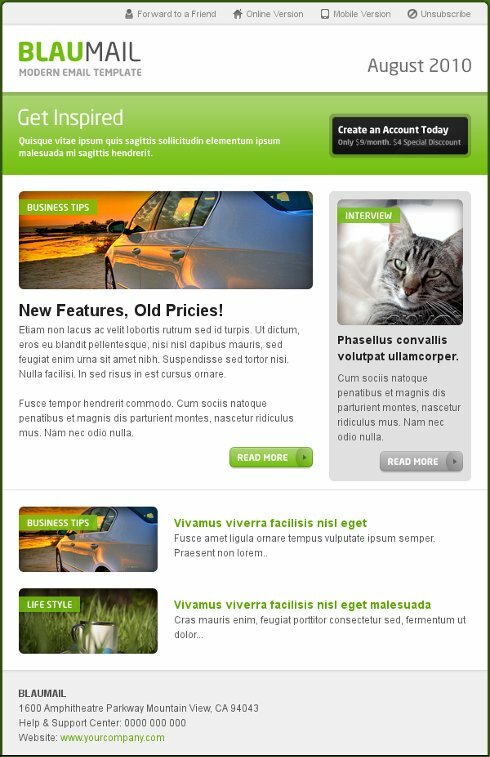 Responsive email template based on fluid structure and Media Queries with ability to remove responsiveness. Layered elements PSD files (so you create your own color scheme or edit any used elements). Well commented valid HTML code. Ready to use “Tweet” and “Facebook share” buttons (powered by AddThis). Mailchimp version (70 email templates with Mailchimp’s merge tags). User friendly documentation covers PSD & HTML editing, useful tips, sending the template, using it in Aweber, Mailchimp and Constant Contact. You can copy/paste/delete/duplicate content blocks (tables) from layout to another to create your custom layout. Titles use Segoe UI font (common on Windows), if recipient doesn’t have it installed it uses Helvetica Neue (common on Mac), if none installed it uses default Helvetica and Arial fonts. Stamplia offer an email template marketplace with tons of beautiful, pre-tested templates that will work with any ESP—and their talented-team has created seven Litmus-exclusive templates that are now available to download for free! Each template is responsive and has been thoroughly Litmus-tested (yes, that means they even work in Outlook, Gmail, and the rest of those tricky clients!). They also come with PSD source files so you can tweak and modify to your heart’s content. So, there you have it. You can find lots of free email templates on the net but we’ve tried to gather the best awesome email templates in a place to make your search easy. Know of any other free email template services? Share with us.